Portability and travel may be cousins, but they're two different things. Portability is something you carry from here to there. Travel is something you'll need to keep using when you're there. So, this month we look at some of those items that might be useful when you'll be away for a while, but still need your electronic support system to help make your life a little easier - and familiar. It seems like such a small matter, but with fees charged by airlines for checking luggage, knowing that you didn't go over the weight limit has taken on more of a meaning for some people. (This is especially true for international travel, which is more restrictive.) Using a bathroom scale might seem the easiest way to go - and it may be, but there's a caveat: if you use a digital scale, they can be finicky at low weights, or not even register at all if they don't have multi-sensors, but rather just sensors on the sides where one's feet go. Luggage scales therefore can fill the need - though have their own caveats. They need to be accurate, of course, but these small devices run the quality gamut. And they need to be light (and small), since using up precious weight allowance and space with a bulky scale defeats some of the purpose. The Tarriss Jetsetter impressed me in pretty much all ways. Its build quality is very solid, and in fact comes with a lifetime warranty. It weighs just three ounces and is about the size of a cigar, with a hanging strap. Some luggage scales use hooks which aren't as preferable as straps that connect (which is how the Jetsetter operates) since it keeps the luggage steady. You pick up the connected luggage and let it rest for a few seconds until the digital read-out locks. This is a benefit, too - non-locking devices require you to maneuver into a position where you can read the digits, all the while changing the read-out. With the Tarris, once the weight locks in, you can put the luggage back down on the ground. Changing between pounds and kilograms is as simple as toggling the power button. The LCD display is very easy to read - though I'd have liked it a bit darker. It comes with a built-in long-life Lithium battery. I like that it uses a battery that shouldn't need changing for a long while, and it's in a tightly-covered compartment. However, should you ever need to replace the battery, that requires unscrewing the compartment. The Jetsetter will weigh up to 110 pounds (far above any airline requirements), and claims to be accurate within .2 ounces. My testing showed it to do quite a good job, though my "home lab" is limited in that area - however, on Amazon the device as a 5-star rating among 123 reviews, and the response there supports the claims of accuracy, as well. 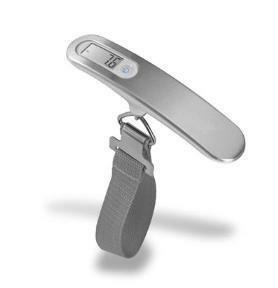 To be clear, the Jetsetter isn't for everyone - though that's the case with all luggage scales. If you're someone who has difficult lifting a heavy bag, then you'll likely struggle with any such device, since they all require holding up your luggage. Know, however, that this isn't a case of carrying a 50 pound suitcase through the airport. You can simply grab the handle with two hands and hold it there for about five seconds until it locks, and then put it back down. The Tarriss Jetsetter Portable Digital Luggage Scale retails for $40, and they have a 25-percent off coupon if you sign up for their newsletter (and offer a free "Ultimate Insider's Guide to Traveling Through Airports"), but you can also find it online for just $20 at the time of writing. I've reviewed portable speakers earlier this year, and thought about including the Divoom Voombox in that column. But I devoted that article to speakers that were especially-small, and the Voombox (while small and very portable) is by no means "especially" small. It has some features that make it good for travel. And that doesn't only include its name. The Voombox is about the size of a flattened baseball. And before I get into any specifics, I'll say up front that it has among the best sound of any small speaker I've tested, if not the best. (Note that all judgment of sound is subjective.) It's a bit bigger than most of the other small portables, so it's not something you'd put in your pants pocket - but it's still pretty small and could fit in a jacket pocket or just toss in an attache or suitcase for travel. The speaker was loud, as well, with an output of 4 watt x 2. 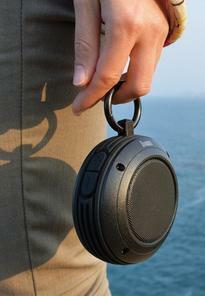 But there's one other feature that separates it from most portable speakers, which helps make it nice for traveling. It's water resistant. To be clear, this isn't "waterproof," you can't drop it in a lake and expect it to keep working. But there's a hook to hang the speaker on a shower head, and if it fell briefly in some shallow water for a brief period, you'd be safe. So, when you're on the road and don't have your favorite radio in the bathroom, you can just stream your music here. Plus, there is a built-in microphone for hands-free phone calls. The Divoom Voombox Travel is extremely well-made, solid and sturdy. Buttons are well-marked. It has s 6-hour rechargeable battery. As I said, it's not the smallest portable if that's what you're looking for. But it's plenty enough small - just 3.5" diameter, and 1.75" In height. It's a hefty 9.5 ounces, more than you'd likely want for tiny, daily carrying, but - really - it is small and very portable. A few words about travel locks before diving into the three that I'll review here. Obviously, locking your checked luggage doesn't work these days since TSA have to be able to get into your bags if needed. So, TSA-approved locks were developed. These allow a special TSA passkey to open any such lock. There are two standards: Travel Sentry (which are identified with a diamond logo) and Safe Skies (that have a torch logo). 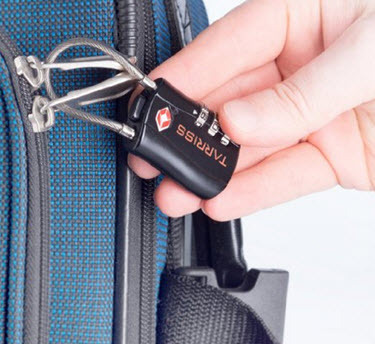 The good is that using a TSA-approved lock now allows you to secure your bags. The bad is that a lock adds weight, which can be an issue particularly with overseas travel. And it's possible for a TSA official to miss the logo and just cut the lock off, and not every international country accepts them - though many do. It's best to check first, and not assume. Also, one shouldn't assume a TSA lock will keep your property safe. They're not the most substantive locks on the market, but meant for luggage - and also there are other ways to get into luggage, particularly if you have a soft-cloth bag. But they're a deterrent to thieves: if there is a bunch of luggage sitting around at an airport, and one has a lock and all the others don't, it's probably best to grab the luggage that's easiest to open. In doing research on TSA-locks, there seemed to be a pattern of many of them having problems, some breaking, and sometimes others being unable to open. However, the three brands I've reviewed here have among the best track record from extensive user comments. Finally, while my preference is locks with four dials, which provide more security, those seem harder to find these days, for some reason, so all those tested here have three dials. And now onto the locks. Master Lock is one of the long-standing leaders in locks, and they have a wide range of TSA-approved locks. For our purposes, I took a look at the 4860D. It's a sturdy, steel lock that comes with a Travel Sentry approval. Twisting the number has a solid feel, and you line them up in boxes that align along the side. To set a combination, you turn the arm a quarter twist and push down on it and hold, while selecting your numbers. It's quite easy, though if you do have to be careful not to let your hand slip off during the process. Once open, the arms spins easily, which helps in threading it through the clamps you plan to connect. It retails for $12.67, but at the time of writing could be found very inexpensively on Amazon for just $7. However, unlike the other two here below, which have full satisfaction guaranteed Lifetime Warranties, the Master Lock has a Lifetime Warranty but limited. The Kolumbo TSA lock is similar to the Master Lock above, but with a couple of notable differences (plus and minus). It's well-made, with a sturdy feel, and I particularly like that it's quite easy to set a combination, the easiest of all three tested locks here - twist the arm, push it down and twist again. No needing to hold it down. This leaves both of your hands free to adjust the numbers, which show clearly in little boxes. The one small downside is that the arm doesn't spin around smoothly when open, unless it's in the exact proper position, and occasionally requires a little jiggling, though to be clear it does turn fine. The Kolumbo has feature I like where a little button that will pop up if TSA agents have had to open the lock, letting you know if this was done out of your sight. It comes with a full lifetime warranty (if you're unhappy with it for any reason, they'll take it back) and retails for $18, but at the time of writing could be found on Amazon for $14. One odd note, you can only find information about the lock on Amazon, not on Kolumbo's own website. [http://www.kolumbo.us/] And one minor caveat: the Kolumbo lock comes in several colors, but I'd avoid the red one, since that's the same color as the Travel Sentry logo which alerts TSA officials that this is a TSA lock, and "red on red" risks being missed. Tarriss takes a slightly different direction with its Travel Sentry-TSA lock, using a flexible steel cable rather than the more traditional iron bar. My first assumption was that I'd prefer the kind of "sturdy" bar-lock I was used to, but I've realized there's an advantage with the cable (which is, of course, plenty sturdy). It's that the cable, being far thinner and more flexible allows you to thread it between the small holes of zippers, or any other tight space you may want to lock. The dials and connection-arrows are well-marked and easy to spin. Changing a combination is a slight bit of a juggling act, though, as you hold the pin in with a pen tip while setting the numbers you want. I actually screwed up the first time, and it didn't take. But the second attempt went fine. (When setting the combination on the second lock, I slipped again, though did get it right.) Of course, setting a combination is something you'll likely only do once per lock. The Tarriss locks use a push button on top which very conveniently pops the cable out. The locks feel very well-made, with the same solid construction of the Tarris Luggage Scale, and it comes with a lifetime warranty. And it too comes with a free copy of Tarriss's surprisingly good "The Ultimate Insider's Guide to Traveling Through Airports" when you register. It comes as a PDF file. You also get a free subscription to periodic travel article updates, which I've found to be quite nice. The locks come in a double-pack which retail for $40, but could be found online at the time of writing for just $19. Oddly, like the Kolumbo, they're not available on the Tarriss website [http://tarrisstravelgear.com/], but only through Amazon. It comes with a "100% satisfaction guaranteed" lifetime warranty. Lenmar is a company that makes very high quality products, mostly in the battery and portable charger fields. I haven't reviewed all that many of their devices, but whenever I have I've been impressed by how solid and well-made they've been. The Mutant is no exception. That said, I do have some questions as to its viability for most consumers, though if you have a need for it, particularly when traveling (hence its inclusion here), you should be very pleased. The Mutant is an extremely high-capacity portable charger, with 20,800 mAh (that's like a dozen charges of a mobile phone) that can not only charge low-powered devices like mobile phones and portable speakers, but also tablets with their higher power requirements. Moreover, it comes with an international power adapter for use around the word. Ultimately, it's that international power adapter why I've decided to review this as a travel product. That's not its only use - or for most people perhaps even its main use. But since it's a standout (and even unique) feature, I that it best to make special note of it. The Mutant is a box just under 5"x6"x1" and weighs in at 10 ounces. So, this isn't something you'll likely stick in a purse or briefcase and carrying around every day. Where it fits in is at home as a device that lets you charge up to four devices at one time. All the slots are well-marked (something lacking in too many other such-units). There are two 1 mAh USB ports for mobile phones and small devices, along with a 2.4 mAh port for a tablet, and another 2.4 mAh port for an iPad (which has different power needs). A very bright series of lights lets you know how much charge is left. Additionally, this can serve as a wonderful backup in case of a power failure or emergency. 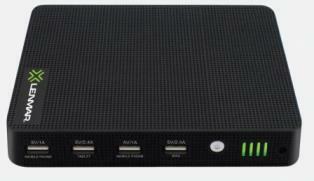 You'll be able to power up most all of your mobile devices and extensively. But as mentioned, I think the Mutant is particularly well-suited for travel. Just stick the unit in a suitcase and have it ready for charging in your hotel room. Finding wall sockets in a hotel room can be a challenge. But with the Mutant - and its massive capacity - you don't need wall sockets, you only have to plug into the device. And if you have a long trip and ever do need to recharge the Mutant, it's only this one device you need to plug in. Not random AC cables all over the room. And then there's impressive feature that the Mutant comes with international adapters for use around the world. You can have a smaller, lighter portable charger when you go overseas, but without the ability to recharge that charger, you're out of luck. 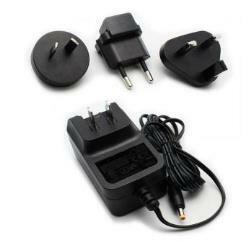 The Mutant provides adapter and also has a wall charger with 100-240 volts input. So, that's the good. And there's much of it. But as I said, I do have some quibbles about viability for most people. It also charges with a proprietary power block, rather an a basic USB cord, meaning you have even more weight to pack -- and something that can be lost. (There should at least be a carrying case for all the separate adapters.) And though many portable chargers these days come with built-in cables, you have to provide your own for the Mutant. Finally, it's pretty expensive, retailing at the time for writing for $199. As I said, these are quibbles for general use. But to be clear, I do think there are people for whom the Lenmar Mutant will be very useful - despite its weight, the high capacity, four USB ports and international adapters can make this essential some, especially those who travel overseas a lot. And if one has many heavy-use devices always in need of charging, the four USB is valuable, with a one-stop device for charging, rather than finding empty wall sockets or multi-port AC chargers. It's a very good portable charging device to toss in a car if you're on the road a lot. And a great back-up for emergencies. And it's seriously well-made. So, while I have some questions whether the Lenmar Mutant finds general needs, it most definitely fits many specific ones. Travel adapters are essential devices when going overseas. They convert the stand plugs of your home country to those of whatever nation you're visiting. I've reviewed several in the past, and they range in convenience, but the Satechi is easily the most unique. First things first: as a travel adapter, this is a convenient self-contained device. That's personal choice which you'd prefer - ones that are self-contained don't have separate parts to keep track of, though they're a bit bulkier and heavier. Those with interchangeable plugs are light, but you need a bag to keep the parts from getting lost. The Satechi makes things a bit more convenient than most, where you have to figure out what region a specific plug fits - it has a sliding knob that's clearly labeled U.K. / Europe / USA-AUST. When you adjust the knob, the correct plug pops out. On the other end, it's designed so that whatever device you're plugging in will fit properly, as long as it's 6 amps or less. It has a 6 amps fuse, so you're protected against an oversurge. There also are two slots each with an output of 2.1 amp to plug in any standard USB device, like if you need to charge your tablet. Therefore, it eliminates the need to pack an extra charger. Your hotel room (or any room you're in) may have a weak Wi-Fi signal, and the Satechi can act as a booster, increasing the signals range. Less likely for most people, but possible, you may come across a Smart TV or video game console that requires an Ethernet cable connection. Again, you can use the Satechi as a wireless adapter, which does the opposite of the feature above: it converts a wireless signal to a wired one. But at its most basic, you may find yourself in a situation where you simply don't have a WiFi router. And this is a router, so it will create a personal WiFi connection for you. Now, while all that sounds like it could be very convenient if needed, it also sounds technically convoluted. 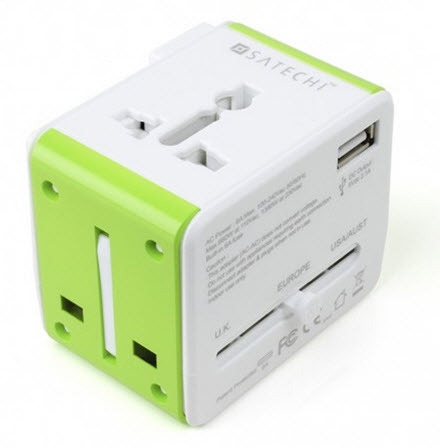 But the Satechi does a respectable job simplifying the process for using he device when traveling on the road. It's easy, but there is some configuring. The manual explains things pretty clearly, though the manual is quite thin on details, and I found that it helped to track down Satechi's own in-house YouTube videos which did a better job. Setting up the device as a standalone home router, though, was another matter: I thought the manual's information for this specifically was weak, and the in-house video doesn't address it. But I suspect most people will get the device just for travel. 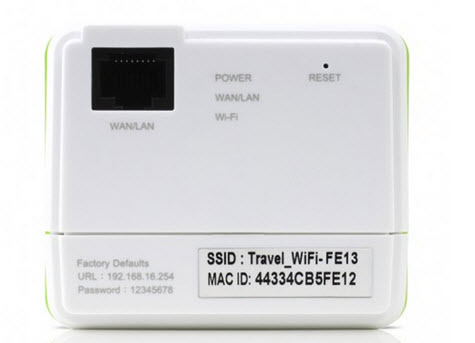 For using it on the road, basically you plug the Travel Router into a wall socket - and then look on the device itself for all the pertinent information. It shows the SSID, for instance. (That's the name you'd look for to connect to in your computer or tablet's WiFi listings.) It also give you the website address to log onto and create your WiFi signal. And it even shows the default password...which you can change after you log onto that website address. To be clear, I haven't yet been able to test this yet in a hotel overseas. For the most part, though, in the paces I did put it through, it works pretty well. It's not the most powerful router, but you're looking for convenience with this. Also, some hotels have unique names for their in-house networks that might not play nice with the Satechi. (For instance, network names with spaces won't pass through when you're setting things up on the Quick Settings pages, though I've read you can manually type in the full name to complete it.) Also, it only supports passwords with numbers and letters, so using special characters won't work, which might be an issue for those who are high-security conscious. At the time of writing, it retailed for $44, but could be found online for $22. If all you need is a basic travel adapter, others do that more simply and lighter. But it's very reasonably light, and if you can find it at $22 that's a very good price, since you also get its versatility, if you ever need it. I found that it seemed to work respectable well, and it's an intriguing travel device. Okay - here's another portable charger. But how in the world can I not include it in a travel article, its very name is "travel charger". TYLT is a company whose range of products I've come to like very much, for their design, cleverness and construction. This device is small and basic, but fits a valuable need. At first glance, it looks like nothing more than an AC charger with foldable plugs. (I love chargers with foldable plugs, by the way, it makes them SO much easier to carry). Stick a USB cable in, and you charge your devices. Fine, easy, done. 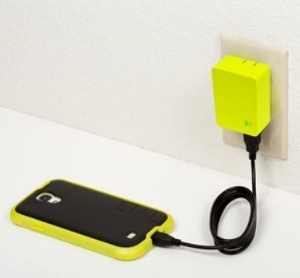 Except the Energi 2K has a second function - pull it out of the wall socket, and you have a portable charger, since it holds 2 mAh of output power, enough to charge a mobile phone. It's a very clever design, providing great usage as an AC wall charger and portable charger - another of my loves is multi-function devices. I just have one caveat, but it's notable. The capacity is pretty small, and there are no built-in charging cables - meanwhile, myCharge makes the Hub 6000 that has an AC plug, as well, but also triple the capacity and built-in USB cables. To be clear, it's bigger and heavy, though highly portable, and it costs much more. At the time of writing, the TYLT Energi 2K retails for $40, while the myCharge retails for $100 though could be found online for $75. As often happens, your needs determine what's most valuable to you. I happen to find built-in cables important. But if you want a portable charger that is lighter, less expensive and can also serve as a wall charger with AC plugs, something very easy to stick in your pocket -- and you're fine with carrying a charging cable -- the Energi 2K is a very nice, little device. In fact, with this in mind, where I can think best fits in is if you're looking for a basic wall charger for travel, the Energi 2K is a terrific choice for its dual usage. Yes, it will cost a little more, but to get a portable charger when you need it is a great back-up to have. A cable? This is just a cable?? What in the world is up with that??! No doubt you have sacks of cables lying around. But that's sort of the point here. Often when traveling, people are required to carry around several USB cables, one of Micro-USB, one for Apple Lightning, maybe others, all of which get twisted around one another that you have to untangle when you want to use them. The TYLT Syncable-Duo does what the company does so well - design things cleverly with added use. This is a single cable with two plugs - Lightning and micro-USB - that snap into one another. So, you only need this one cable when traveling, and it's a non-tangle design. A strip of rubber keeps the two plugs connected. It seemed pretty sturdy when I tugged on it, though I don't know if a serious yank could snap it off. But treating it humanely would be just fine. At the time of writing, a one-foot Syncable-Duo retailed for $25. (There's a 3.3 foot model for $30.) Clearly if you have a lot of cables, you might decide you don't need to play for this. But keep in mind that if you have to buy a certified Lightning cable, the cost of it alone (generally around $10-14) might help justify this. Further, I found it very convenient to toss into a briefcase (or suitcase) and not worry about grabbing the right one and having to untangle it each time.